Updated at 6:00 a.m. Eastern. (AP) HEFEI, China - The wife of a disgraced Chinese politician was given a suspended death sentence Monday after confessing to killing a British businessman by poisoning him with cyanide in a case that rocked the country's top political leadership. A suspended sentence is usually commuted to life in prison after several years. Sentenced along with Gu Kailai was a family aide who was given nine years' imprisonment for his involvement in the murder of Neil Heywood, a former family associate, said He Zhengsheng, a lawyer for the Heywood family who attended the sentencing in this eastern China city. Standing in court after the verdict was announced, Gu called it "just." "It fully reflects the court's special respect toward the law, reality and life," she told the court. 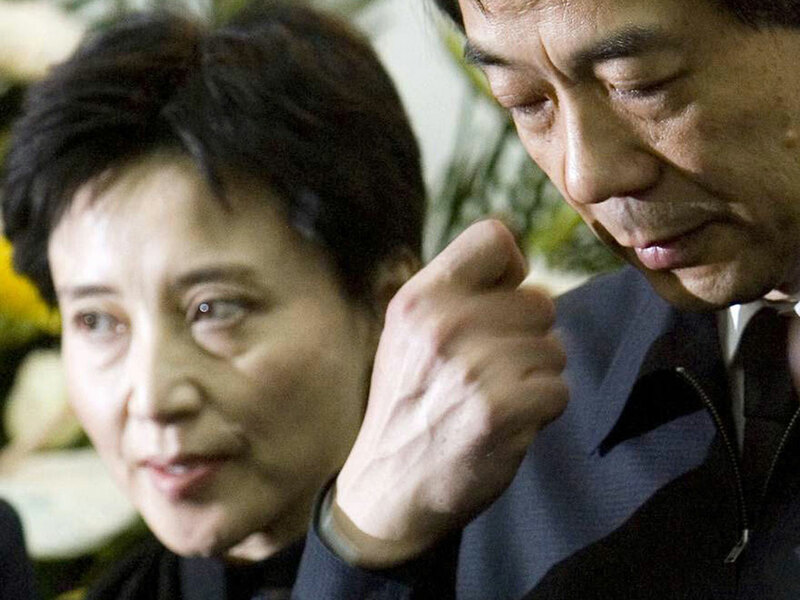 The sentencing closes one chapter of China's biggest political crisis in two decades, but also leaves open questions over the fate of Gu's husband, Bo Xilai, who was dismissed in March as the powerful Communist Party boss of the major city of Chongqing. His dismissal and his wife's murder trial come at a sensitive time in China, with party leaders handing over power soon to a younger generation. At one time Bo was considered a candidate for a top position. The lawyer He said he had to discuss the verdict with the Heywood family and did not know if they would lodge an appeal. "We respect the court's ruling today. Thank you all for your concern," He said. State media say Gu confessed to intentional homicide at a one-day trial held here Aug. 9 under heavy guard. The media reports - the court has been closed to international media - say she and Heywood had a dispute over money and Heywood allegedly threatened her son. Gu was accused of luring the victim to a Chongqing hotel, getting him drunk and then pouring cyanide into his mouth. The family aide, Zhang Xiaojun, also confessed after being charged as an accessory. He had been expected to get a lighter sentence as state media reported from the trial that Gu planned the murder. Security was tight outside the court on Monday. Police officers stood guard around the building. At least a half dozen SWAT police vans were parked on each corner, some of them carrying plainclothes security. The main road in front of the entrance was blocked by traffic cones. Any ruling in the Gu case would have been politically delicate, and Chinese leaders may have decided to impose a lengthy prison term instead of death for fear that a more severe penalty might stir outrage or make Gu look like a scapegoat for her husband's misdeeds, political and legal analysts say. The party says Bo was removed due to unspecified violations. Cheng Li, an expert in Chinese elite politics at the Brookings Institution in Washington, said the verdict was fair. "My sense is that the Chinese public, including the legal profession, the majority will think it is well deserved," he said. Li said the ruling against Gu will set expectations for Bo to be dealt with severely. "If Bo does not get put through the legal process in the next few months, Gu will be seen as a scapegoat," he said. The British Embassy, which had consular officials attend the trial, issued a statement Monday saying it welcomed the fact China had tried those it had identified as responsible. The statement said Britain had told China it "wanted to see the trials in this case conform to international human rights standards and for the death penalty not to be applied." Gu's arrest and the ouster of her husband sparked the biggest political turbulence in China since the bloody crackdown on the Tiananmen Square pro-democracy protests in 1989.